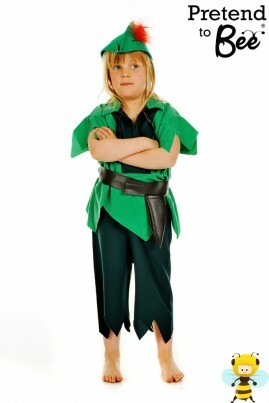 Whether it be Neverland or Lapland this is the Costume for You! Fly away to Neverland to hang out with the lost boys, Tinks, and that evil Captain Hook! Suade Tunic Top with Mock Leather Belt and Sheaf. Elasticated 3/4 length Trousers, and felt hat with feather.